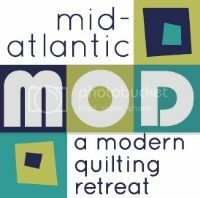 mid-atlantic mod: a modern quilting retreat: Registration Now Open! Please click on the link below to complete the registration form for Mid-Atlantic Mod. Please be sure to read the form carefully. After we receive your registration, you will be sent an e-mail (within about 24 to 48 hours) indicating whether you have been registered to attend or if you have been placed on the wait list. If you have been successfully registered, the e-mail will provide instructions on how to pay your registration fee and how to make hotel reservations. You will have 1 week from the time of receiving an e-mail to complete your payment and hotel room reservation. If you do not complete these items within the allotted time, your spot will be given to someone on the waitlist. People on the wait list will be granted registration on a first-come-first-served basis. Please note an important change to our lodging policy on the About page. As of the time listed above, we are no longer able to accept registrations for anyone who does not wish to stay at the hotel in our group block due to our room block requirements.